Total Clean Solutions providing Exterior Cleaning Services including Bicarbonate Soda Blasting and Cleaning and Steam Cleaning. TCS is a Professional Industrial Cleaning Company based in Immingham, NE Lincolnshire. Total Clean Solutions understand the importance of keeping fleet of vehicles or containers in a well maintained condition. Total Clean Solutions offer fleet vehicle schedule clean, this can also incorporate a fleet of containers used for HGV's or shipping containers. We understand the importance of keeping equipment and fleets in a well maintained condition. Working with engineers and fitters we offer a mobile steam cleaning and degreasing service to prepare equipment for service / repair. As you will be aware Illegal immigrants are entering the country on a daily basis, often in the back of trailers. They leave behind them ; clothing, personal effects and often faeces and urine. All of which must be disposed of in accordance with the Local Health Authority Controlled Waste Regulations Act 1992. Often the cargo and trailer itself become contaminated and as a result delivery in the UK is refused. Container fleets inspected , cleaned and repaired to eliminate wasted journey charges. Remove soil and Residues from Imported plant and machinery. Food Grade Foam the entire area required for cleaning, then left to penetrate the soiled area for 20 minutes. Total Clean Solutions mobile services bring professional cleaning services to your place where ever it may be in the UK. If you need Graffiti Removal Services, Pressure Washing Services, Bicarbonate Soda Blasting, Building Cleaning Services or Industrial Cleaning Services we do it and bring it you. Architectural & Buildings As soda blasting causes no abrasion to substrate materials (such as brick, stone and wood), it is quickly becoming the number one solution in property restoration, cleaning and protection. We are able to safely remove decades of surface contamination and coatings to bring the host material back to its original and natural condition. Bicarbonate of soda is particularly effective when used on a variety of substrates including oak beams, brickwork and limestone walls. Automotive Bicarbonate of soda is much less abrasive than other blast cleaning options, such as sand or grit. Its ‘non-destructive’ qualities mean that once it reaches the base material (including alloy, aluminum and steel) it will cease to strip layers or cause any damage. Further to this, unlike other products, soda blasting does not create any heat, so there is no risk of panels becoming distorted or warped during the process. Commercial Business Property Exterior Cleaning, Graffiti Removal, Paint Removal, Steam Cleaning, Bicarbonate Soda Blasting & Cleaning and more, contact Total Clean Solutions so we can help you. Engineering Soda blasting is perfect for degreasing and cleaning engineering plants and equipment by removing all unwanted build up including oil, grease, carbon, inks, debris without harming the host material. It is also safe to use on all metals and alloys, chrome plated components, bearings, seals and hydraulic cylinders. Quayside & Marine Total Clean Solutions understand the importance of keeping equipment and fleets in a well maintained condition. Working with engineers and fitters we offer a mobile steam cleaning and degreasing service to prepare equipment for service / repair. Industrial & Factory One of our specialist services , we can introduce a tailored factory and site cleaning routine. Whether daily , weekly , periodic or simply a one off, Totalclean can offer a service to suit all. We employ the very latest cleaning technology and our aim is to offer you an industrial cleaning service which uses no harmful chemicals or abrasive techniques and is environmentally friendly. 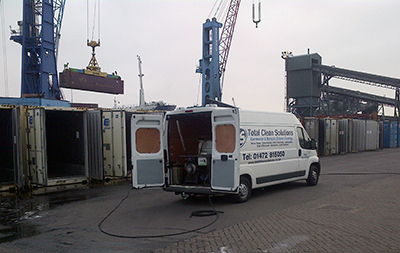 If you have any questions regarding Total Clean Solutions fleet management cleaning services please call using the numbers above or contact Total Clean Solutions by our online contact form, we are always happy to assist you with any container / reefer cleaning questions you may have. If you feel you would like to receive a quotation for a fleet management cleaning job, you can either get a online quote with the ability to send Total Clean Solutions photo's of the job that needs cleaning or call on any of numbers above. Send TCS your details with images, and receive your FREE quotation within 24 hours.